This continues the California Surfing Series. Last post, “Wipeout!” detailed some things that can run awry. 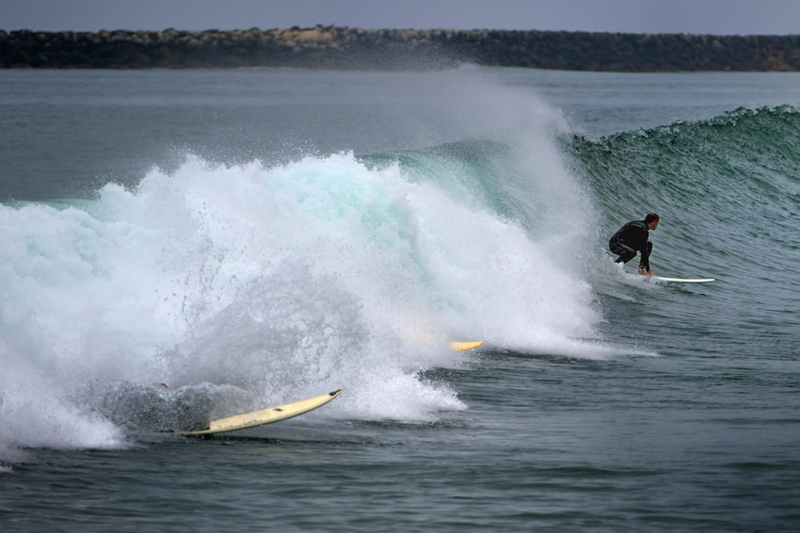 This set of shots, all from Oceanside, show how it is done. I was struck by the ratio of longboard vs shortboard Surfers. It seemed most of the Veterans used the long and the younger dudes (and dudettes) used short. I am assuming that this is similar to the ski vs snowboard battle! Since the late 1960s, when Gordon Clark found the optimum formulation of urethane foam, many of the surfboards in common use have been of the shortboard variety between 6 feet and 7 feet in length, with a pointed nose and a rounded or squarish tail, typically with three skegs (fins) but sometimes with two or as many as five. 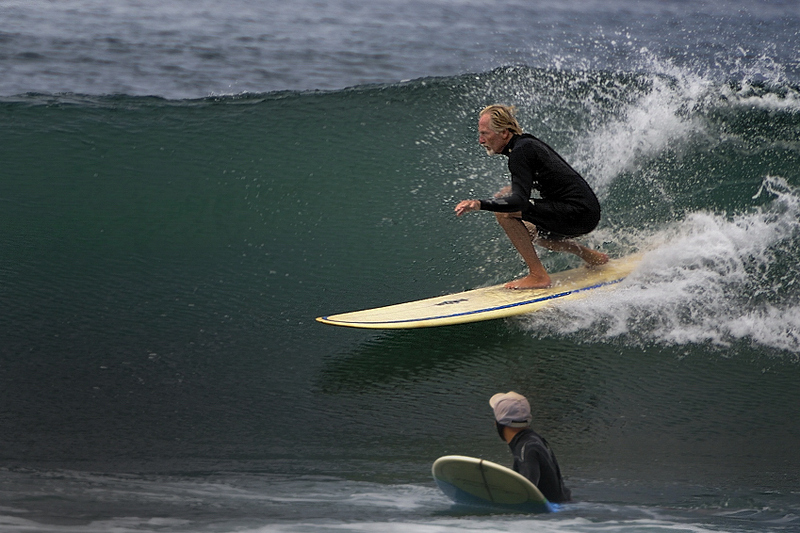 Surfers generally find a shortboard very quick to maneuver compared with other types of surfboards, but because of a lack of flotation due to the smaller size, harder to catch waves with, often requiring steeper, larger and more powerful waves and very late takeoffs, where the surfer catches the wave at the critical moment before it breaks. Longboards (also known as Malibu boards) range 8 to 14 feet (2.4 to 4.3 m) long, or 3 feet (0.91 m) taller than the rider in overall length. Its advantage is its substantial buoyancy and planing surface, which enables most surfers using it to ride waves generally deemed too small to propel a shortboard, as well as anything else. Longboards are universally common among both beginners and skilled surfers alike. The main reason why longboards are more suitable for beginners is because of the board’s size and frequency of catching waves. In the proper conditions, a skilled surfer can ride a wave standing on the nose of a longboard, and put his toes over the nose’s edge. By literally putting his “toes on the nose” the surfer can “hang ten”. 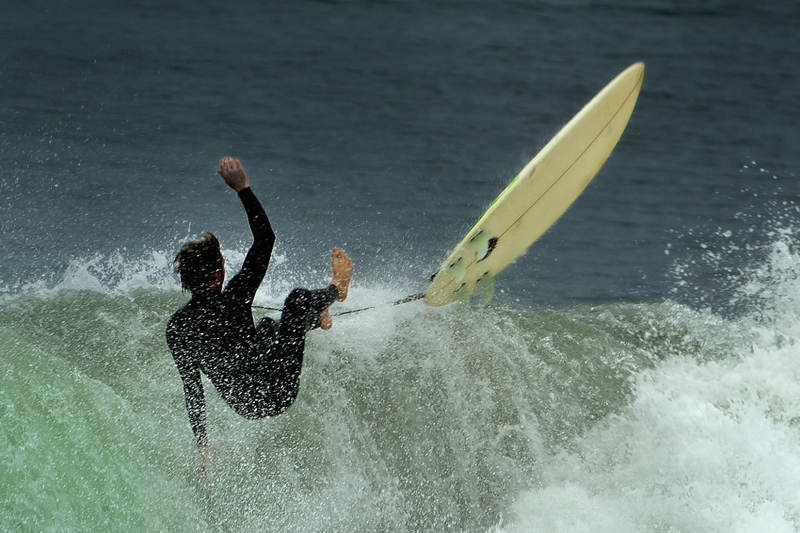 This continues the Surfing Series at Oceanside California and Swami’s in Encinitas. 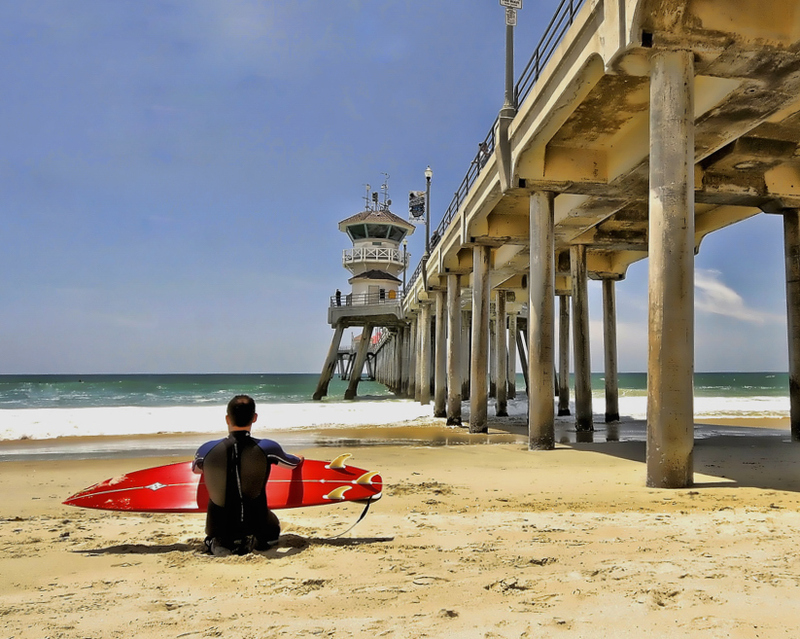 Both are renowned surfing destinations home to many seasoned veteran long boarders, pro short board acrobats and many a Rookie who just want to enjoy this challenging sport. 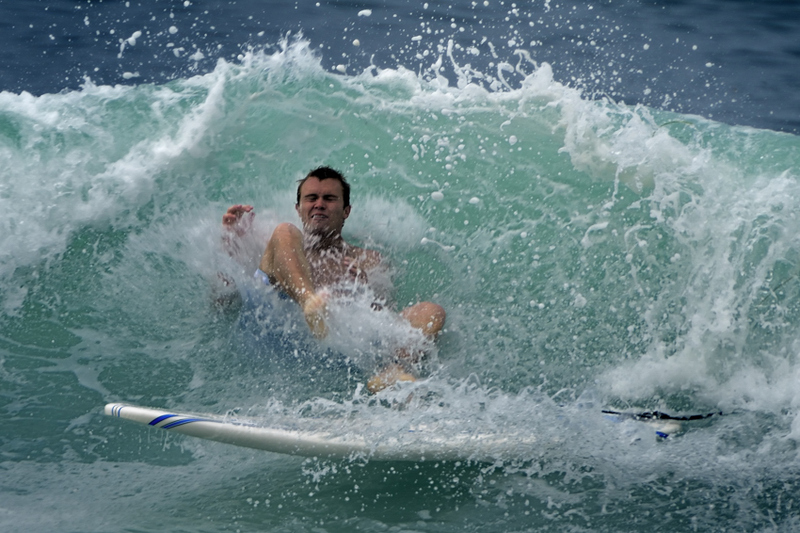 These images capture the learning process, or what goes amiss when the surfers push the envelope. I recall a song my oldest Brother used to play in the 1960’s called “Wipe Out” when I was young – I never envisioned that I would be hearing this in my head as I shooting! “Wipe Out” is a tune written by Bob Berryhill, Pat Connoly, Jim Fuller and Ron Wilson. The tune was first performed and recorded by The Surfaris, who were elevated to international status with the release of the “Surfer Joe” and “Wipe Out” single in 1963. The song – both the Surfaris’ version as well as cover versions – has been featured in over 20 films and television series since 1964, appearing at least once a decade. First heard in Kenneth Anger’s short Scorpio Rising, its most recent appearance was in Dominic Sena’s 2009 thriller, Wipeout.